Description: Large slender bodied sawfish; skin rough; olive brown green dorsally and pale white ventrally; first dorsal fin in behind pelvic fin origin; no fork in caudal fin; rostrum teeth extend onto base of saw; rostrum does not taper distally like rostrums of freshwater and dwarf sawfishes. Distribution: Reported in very low abundances to inhabit inshore and offshore waters of southern and central Queensland and in higher abundances in the northern region including the Gulf of Carpentaria. They are also found in the Northern Territory, New South Wales and Western Australia. 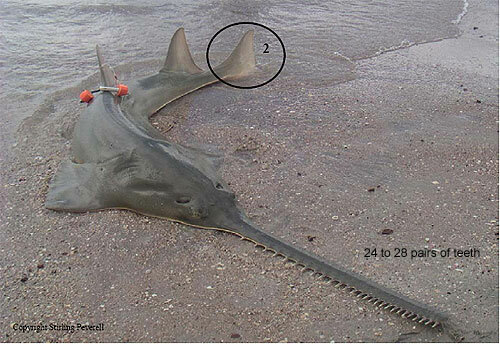 Green sawfish inhabit coastal foreshores and bays mostly in their juvenile life stages and marine waters to a depth greater than 40m as adults. Adults are known to seasonally frequent inshore waters and rivers during the monsoonal months to pup. Catches of green sawfish are very low and are highly variable. Juvenile green sawfish are vulnerable to capture by recreational line, cast and seine netting activities on coastal foreshores. Fisheries: Commercial trawl, gill net and long line fisheries. Recreational line fishery and bait collection using small mesh cast nets and seine nets. Indigenous net and harpoon fishing. Foreign illegal gill net and line fishing. CANBERRA, March 2, 2008 AAP - The green sawfish has been listed as vulnerable under federal environmental laws, making it illegal to catch the fish within 200 nautical miles of the Australian shoreline. The sawfish, which takes its name from its flattened head and elongated snout studded with up to 28 pairs of teeth, is virtually extinct in south-east Asia and rare outside of northern Australia.